To celebrate Pakistan Day, We tested our agency’s national spirit with a quiz to find out how Pakistani they REALLY are… and whether they actually DESERVE to have the day off and celebrate the national holiday! The 10 questions all required you to know the details of historical events as they unfolded prior to independence as well as key information about the land we call “HOME”! To claim the prize you needed to score the most correct answers in the shortest span of time and the winner was revealed on our Facebook page on 23rd March! 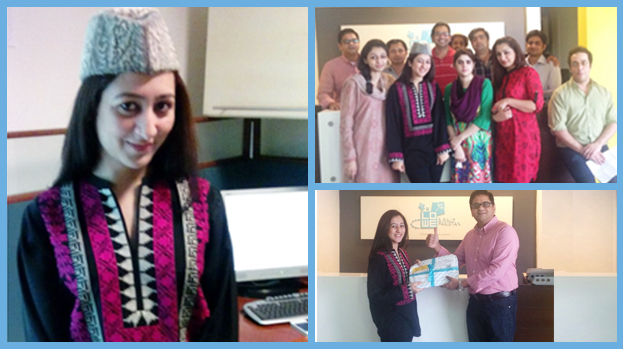 The title of MOST PATRIOTIC was won by KIRAN IFTIKHAR an Account Manager from our Lahore team, who was elated by the arrival of her prize: a Jinnah cap! It was great to have everyone wrack their brains and get nationalistically competitive!